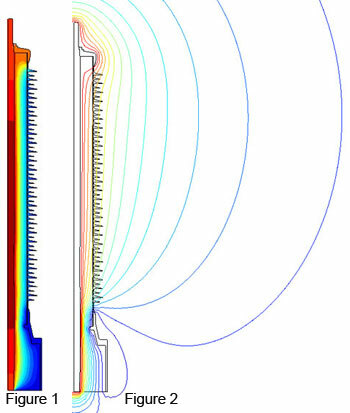 Many engineering design problems often involve a combination of physics simulations: electromagnetic, thermal, computational fluid dynamics, structural and power systems. When the various disciplines are interacting, modeling requires CAE software that provides accurate answers. Engineers and physicists need fast, reliable solutions when more than one physical phenomenon is involved. To support their work, INTEGRATED develops comprehensive solutions for scientists modeling prototypes that require a multidisciplinary analysis. In several electromechanical systems it is important for the various solvers to be combined. For example, for induction heating, the induced eddy currents are used for heating up a component. This magnetic analysis is affected by the thermal analysis and vice versa. Thus, the electromagnetic solver needs to be combined with the thermal solver. In terms of particle trajectory calculations, the path of the particle may be determined by a DC magnetic and electric field as well as a time harmonic high frequency field. In such cases, all three fields need to be combined to determine the path of the particle. The systems can be coupled as determined by the physics of the problem. INTEGRATED develops comprehensive solutions for scientists modeling prototypes that require a multidisciplinary analysis. INTEGRATED includes both, the Boundary Element Method (BEM) and Finite Element Method (FEM) solvers in the same package to allow designers greater choice and to use the best method for any problem. Engineers can choose for the Finite Difference Time Domain solver if it better fits their designs. The design optimization through parametric analysis, API or scripting – included in the software package – allows review of prototypes until the desired result is reached, thereby cutting hours of design time, especially when various disciplines interact closely.